US budget hawks have labelled a plan to hike defence and domestic spending by hundreds of billions of dollars as a debt-ballooning "monstrosity". 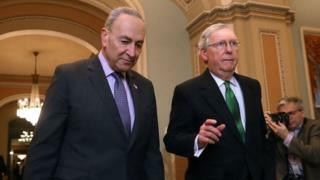 In a rare show of bipartisanship, Republican Senate leader Mitch McConnell and Democratic counterpart Chuck Schumer agreed the two-year pact. The bill is expected to clear the Senate comfortably, but face opposition in the House of Representatives. It comes on the eve of a deadline to avert another government shutdown. Congress has to reach a deal before government funding runs out at midnight on Thursday, when a one-month spending bill is set to expire. Both Democrats and Republicans in the House of Representatives have voiced disapproval of the bipartisan bill. White House legislative affairs director Marc Short said the package would increase spending by "just shy" of $300bn (£216bn). The Washington Post puts the figure at half a trillion dollars. The Senate bill, which has not yet been publicly unveiled, reportedly increases defence spending by $80bn in the first fiscal year and $85bn in the second. Non-defence spending, such as a programme to provide health insurance for children, would reportedly increase by $63bn this year, and $68bn next year. The taps of government spending are open once more - at least if the US Senate gets its way. When faced with the question of whether to boost military or domestic spending, Capitol legislators have their answer. Why not both? That marks a decided change from the mood seven years ago, when Congress - pressured by conservative factions - felt compelled to address growing budget deficits after the economic collapse of 2008 and subsequent federal emergency stimulus efforts. Republicans and Democrats agreed to harsh fiscal medicine - mandatory spending caps on military and social programmes. Those days are long gone. At the end of 2017, Republicans pushed through a tax-cut plan that added $1.5tn to the 10-year budget deficit. Now it seems likely spending will surge upward as well, despite the Trump administration's promises of an austere budget last year. The Senate compromise still has a perilous path through the US House of Representatives, as fiscal hawks worried about federal spending and liberals angry over the lack of an immigration deal threaten opposition. With midterm elections looming, however, it's likely that enough legislators on both sides of the aisle will welcome a two-year reprieve after months of shutdown drama. Why are some Democrats unhappy? Mr Schumer argued the budget accord would "break the long cycle of spending crises". But a number of his fellow Democrats are upset that the bill does not address immigration. 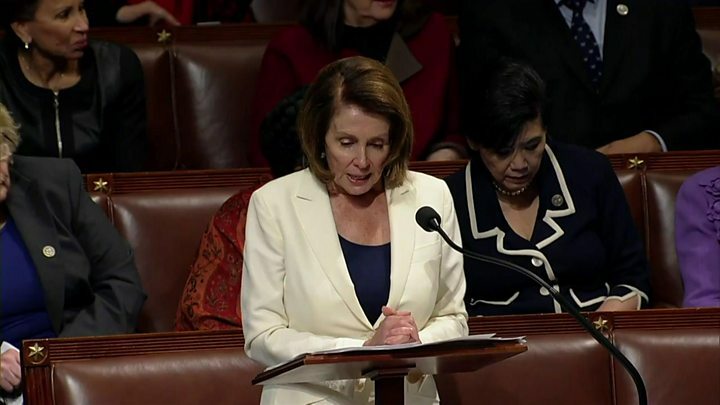 His House of Representatives equivalent, Nancy Pelosi, told the stories of immigrants in a speech lasting eight hours on Wednesday - setting what is thought to be a new record for the longest speech ever made in the House of Representatives. The 77-year-old vowed to oppose any budget that does not include protections for so-called Dreamers, young immigrants who entered the US illegally as children. Congressional historians believe the California lawmaker's speech is the longest in House history. Why are some Republicans opposed? Conservative Republicans are up in arms about the bill's ramifications for the US federal debt. When asked if he supported the bill, Alabama Republican Mo Brooks said: "I'm not only a no. I'm a hell no." Mr Brooks, a member of the Freedom Caucus, a congressional group of budget hawks, dubbed the bill a "debt junkie's dream". He called his fellow Republicans the party of "big spending" and "big government". Dave Brat from Virginia agreed, calling the bill a "Christmas tree on steroids". Freedom Caucus leader Jim Jordan, of Ohio, said the agreement was a "monstrosity", which he found hard to believe could have emanated from his own party. Does the US debt of $20tn matter? What's the White House saying? Deficits are already projected to climb because of the Trump administration's $1.5tn tax cuts, which were approved by Congress in December. White House spokeswoman Sarah Sanders praised the Senate bill, saying "we're certainly happy with the way it's moving". "The budget deal should be a budget deal," she told a news conference, dismissing Democratic demands that it include a concession on immigration. Officials at the White House say the deal would also increase the debt ceiling until March 2019.